What type of writer are you? There are two distinct variations on the writer (this includes the poet too), the planner and the doer. 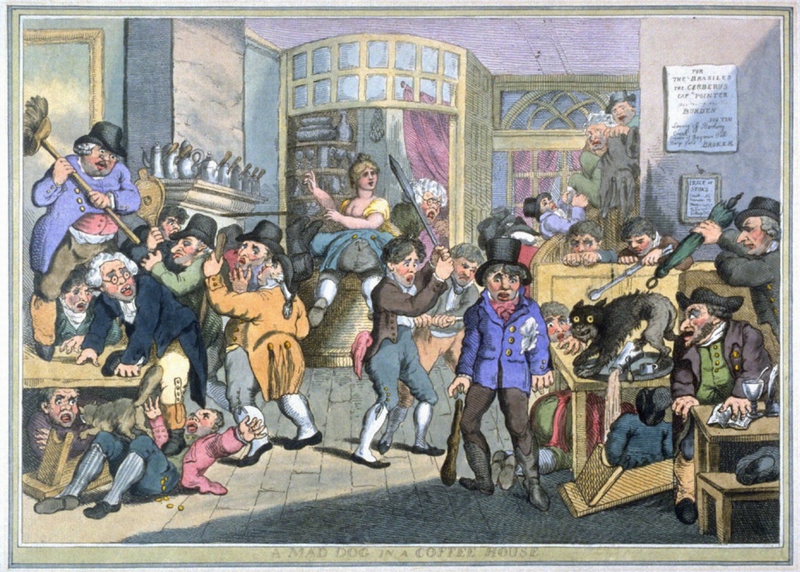 A simple way to test this is to do the task, a mad dog in a coffee house. Ask a group of writers to imagine this scenario and write about it, that is all. You do not embellish or add to it, you don’t even share the image above, just the word ‘imagine’ is enough to release that mad dog among writers. Twenty minutes later and you will have a group that will be split asunder. There will be those who have written, it will be sensory, it will have moments that are wonderful but there will be no main character or story yet. Just a wonderful tapestry of sounds, smells and maybe how the dog felt but nine times out of ten they will have developed the wrong or no protagonist. There will be the other group who will be scratching their heads, taking notes, developing lists but who are unable to start the story without planning what will happen. They will have developed a great character, will give you a wonderful backstory on why they were there at that moment but it will be devoid of the scents, the sounds and the feeling of the moment. These writers are the planners, the theorists and those that just start writing are the doers, the activists. Both extremes are difficult for a writer. I fall into the latter camp. I can do research. I can plan to the dog runs out the coffee shop door but I spent too much of my youth listening at the feet of my mother as she gossiped with her friends, have heard the decline and change in how we talk and how we have learnt not to talk in the face of smartphones. The art of conversation is waning. I do. I sit. I write. I am a doer. This is reflected in my life, I find it hard to sit and relax, I will daydream doing something else but my hands and mind will always be busy. I do not have an off switch. When I write I find the thread that connects it all. I visualise a place. Sometimes I post a photo above my computer and work from it. You can see this in the photos I selected for #ayearofwriting. I listen for sounds in the world I create. I fill my nostrils with the world I step into. I am not of the ilk that draws maps of the place, if I tread a path, I try to remember where it was but if I get lost in that world, so be it. Maybe there will be something interesting just around the corner. Maybe that is where the story starts. Planners stories start from a moment they planned for. Doers stories starts sixty pages in. Yet there is danger in being the doer. When in writers groups or workshops, doers are vulnerable as well as applauded. They can create stunning images but as a doer I know if I ask the right question, all that comes to nothing. The question is often the simplest, why is the protagonist there? What kind of dog is it? What does the character’s friend do for a living? Why a dog? So on and so on until all those wonderful images unravel. The planner will answer all these, will give you the beginning, middle and end. Then you ask them, how did the coffee taste? You don’t allow them to research coffee from the period the work was set in. You ask them what the coffee tastes like, really tastes like. Does everyone taste it the same? A planner may only ever consider the character who they are planning for, their secondary characters will be a backdrop. You can see the arrogance of both types in such stories where colonists travel to other planets, see Star Trek, assuming those other planets will be like our own moral compass. Isn’t it unusual that in the entire Star Trek universe that 90% of the aliens they meet are bipeds? That nearly 100% can be talked with, reasoned with and made to understand the William Shatner way of living? We see stunning worlds but rather mediocre societies that are always somewhat like our own. We will take our emotional baggage to the stars, it won’t be waiting for us when we get there. We have to remind ourselves of that. Sometimes the most difficult decisions in writing are the right decisions. The planner can over think a story, too many lists, index cards, files on the computer, trips to catalogue an area and plan an entire piece of work before even writing it. There is a danger here that plot becomes dominant, that the voice of the character is just the voice of the author. There are moments you talk with other writers and they cry into their coffee because their mad dog isn’t staying on the leash. I remember one writer in a workshop scream at me that it wasn’t fair that his protagonist was being influenced by the readers in the workshop; they didn’t believe the ending his character got and the writer was exasperated that they couldn’t see how much planning he’d done to get the story to where it was. Sadly, a reader will never see this planning too, there are no appendixes in fiction. From the workshop’s point of view there hadn’t been enough emotional investment for the protagonist to achieve the ending they got. It seemed, as one student said, forced, unbelievable. Another cut to the core of it, it had no heart. We can all write about what we see but the further we getaway from locations we know, locations we have some emotional investment in, the harder it is to make those places seem real with out writing what we know about emotions. We write what we feel, that is what is meant when some writers tell you to write what you know. Love can happen on Mars. Mars is just the backdrop. Mars is just window dressing. Hatred can happen in Scunthorpe. Never been there. Doubt I ever will. I know anger though and I can plan the rest because I know how people feel about places. The planner can sometimes slip into making characters do what they tell them to do whereas doers are guilty of just being along for the ride and neglecting to plan how the world is set out. Either extreme has to find a little of each other in their work, a planner must sometimes follow in the wake of character, become a doer for a moment that requires it. Feel the moment. A doer must stop reveling in the sensory language of their world and plan how the mad dog will get out of the coffee house or whether the mad dog has an owner. In the end it is about that, owning your work, inside and out, so when questioned you can talk about it in terms anyone could understand. Just don’t ask a writer where they get their ideas from. On this, planners and doers are in full agreement. We get mean with you. We take the piss. clifimadnesscreative writingcreative writing pedagogydifference in writersfiction writinghow to write fictionwhat kind of writer can you be?